For a team which can never find a franchise quarterback, the Cleveland Browns certainly don’t appear short on potential fixes for this issue. This offseason alone, Cleveland has seen its name linked to numerous QBs. Whether it be via the draft, trade or free agency, everyone seems to have a solution on how the Browns could go about finding their quarterback of the future. I’ve already noted my opinion on finding a fix within the upcoming draft class. If Cleveland wants to select either Mitch Trubisky, Deshaun Watson or DeShone Kizer, it should only be done with any other pick but the top overall. None of these incoming rookies merit going No.1. I’ve also discussed the most popular trade candidate for the Browns – New England Patriots backup Jimmy Garoppolo. While I’d be on board with Cleveland swinging a deal for Tom Brady‘s understudy, I’m not convinced he’s worth the first round pick the Pats are asking for. Outside of these options, there still seem to be many plausible scenarios available for the Browns. Of course, none of them could be seen as “franchise quarterback” material. Still, it’s important to take a look at some of the more popular names being considered with Cleveland. Per Mary Kay Cabot of the Cleveland Plain Dealer, this includes Tyrod Taylor, Tony Romo and AJ McCarron. The former has heard his name tagged to the Browns about as much as Garoppolo, though acquiring him wouldn’t be as complicated. Provided Taylor is cut by the Buffalo Bills – something many believe will take place – all Cleveland would need to do is sign him in free agency. Part of the reason Taylor is a popular name for the Browns is the fact the team just hired David Lee as its new quarterbacks coach. Lee worked with Taylor in Buffalo, and is said to be a big supporter of his. That said, would this be a legitimate solution to Cleveland’s quarterback woes? Taylor is definitely an efficient quarterback, throwing 37 touchdowns and only 12 interceptions in two years with the Bills. He can also hurt defenses on the ground without the carrying the same injury-prone label as Robert Griffin III. At the same time, nothing about Taylor screams “franchise guy.” His performance in Buffalo has been good for the most part. Not great, not awful, just good. While you could argue the Browns would kill for a quarterback who fits this description, does that mean Taylor could be a savior, or just another stopgap? Another player Cleveland could acquire in free agency, presumably, is Romo. Provided the Dallas Cowboys release him now that Dak Prescott has taken the reins, he’d be available for the Browns to consider. That said, it’s tough to find many positives with this potential signing. For one, what can a soon-to-be 37-year-old quarterback do for a team looking to build with youth? Quite frankly, Romo is the opposite of a long-term solution. Even if the Browns did sign him, how long could they expect to have him at their disposal? 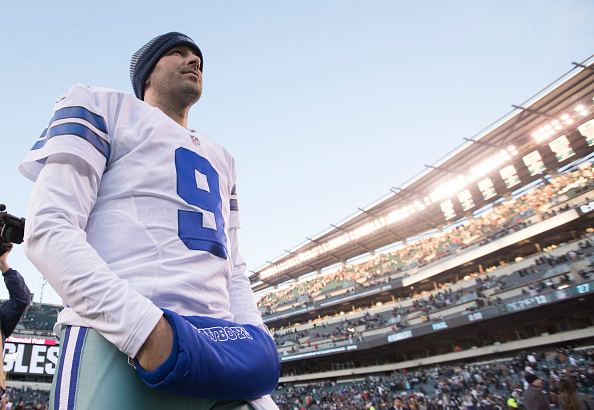 Back issues have limited Romo to just five games across the past two seasons. Cleveland already rolled the dice on a damaged quarterback in Griffin. There’s no point in trying it all over again with an older player. The last option, McCarron, is mildly intriguing. He’s sat behind Andy Dalton with the Cincinnati Bengals for three seasons now, only getting action in 2015. In the eight games he played that year, one in the postseason, McCarron was decent. He certainly performed well enough in the lone playoff game to come out victorious, but the Bengals ended up spoon-feeding the Pittsburgh Steelers a win thanks to thoughtless penalties. Consider, too, the fact Jackson has a level of familiarity with McCarron, as he was Cincy’s offensive coordinator in 2015. That said, this pickup would have to be done via trade. While it would likely cost less than what the Browns are being asked to pony up for Garoppolo, it’s difficult to believe the Bengals would be willing to trade their backup to a division rival. At the end of the day, McCarron, like the rest of the aforementioned options, would be nothing spectacular. Neither he, Romo or Taylor are going to be seen as an obvious solution in Cleveland. Of the three, Taylor seems like the safest bet, due to how he’d be acquired, his ability to stay healthy and the fact his resume is the most appealing. Romo certainly has better stats, but his age and fragility are two enormous red flags you can’t ignore. Still, none of these names really jump out as sure-things. If anything, it just proves the options are there for the Browns. They just need to pick the best one. Unfortunately, it’s been a long time since Cleveland accomplished such a task.